For some reason, the faithful mini cabbage (aka Brussels sprout) has a bad rap. I suppose this is because so many of us have been tortured by boiled-to-mush dishes, served up by well-intentioned grandparents. Brussels sprouts have a slight bitter taste, though it's important to keep in mind that some of our most treasured treats are bitter (including chocolate and coffee). Brussels sprouts are teeming with health benefits, from detoxification to cancer prevention to joint protection. It’s worth it to give them another chance to impress your palate and heal your body. In the end, it all comes down to how they’re prepared. By adding a sweet, honey & tahini dressing to these mini marvels, they’ll soon become a family favourite! Try out my Roasted Brussels Sprouts with Tahini Dressing recipe. 1. Brussels Sprouts are anti-cancer. 2. Brussels Sprouts are inflammation fighters. 3. Brussels Sprouts are an excellent source of Vitamin C.
4. Brussels Sprouts are great for detoxification. 5. 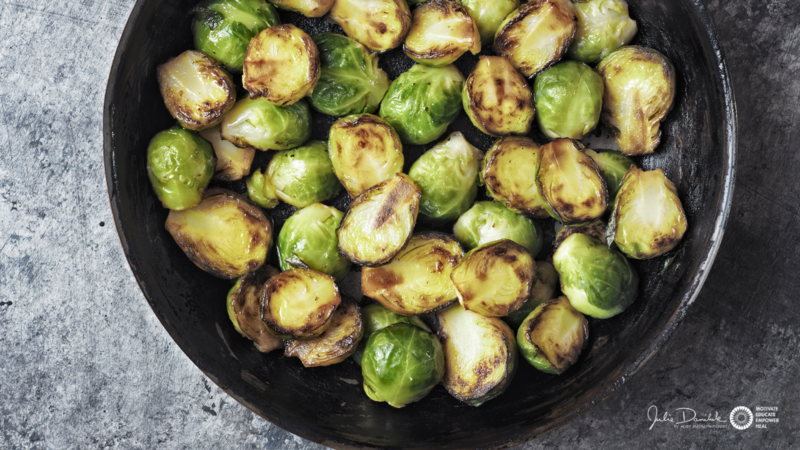 Brussels Sprouts are a stomach protector.